They are trusted advisors and true believers, stakeholders and sounding boards, investors and advocates — and most of all proud Miners. Who are these champions? They’re members of Missouri S&T’s eight academies, and they’re using their superpowers to make a difference. Whether they are advising department chairs, visiting classes as guest speakers, fundraising for priority projects, cheering for student-athletes or endowing scholarships, academy members personify Miner pride in action — and the power of partnership. 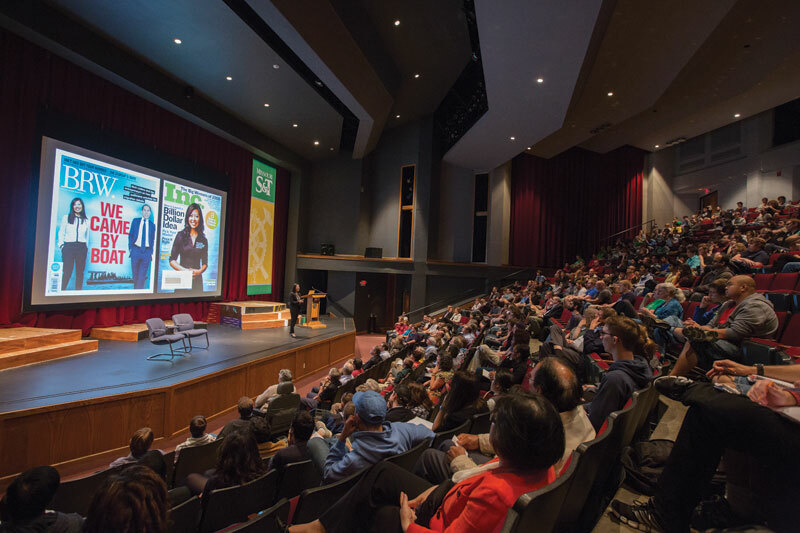 Here’s an overview of Missouri S&T’s eight academies and how they are answering the call to lead and serve. 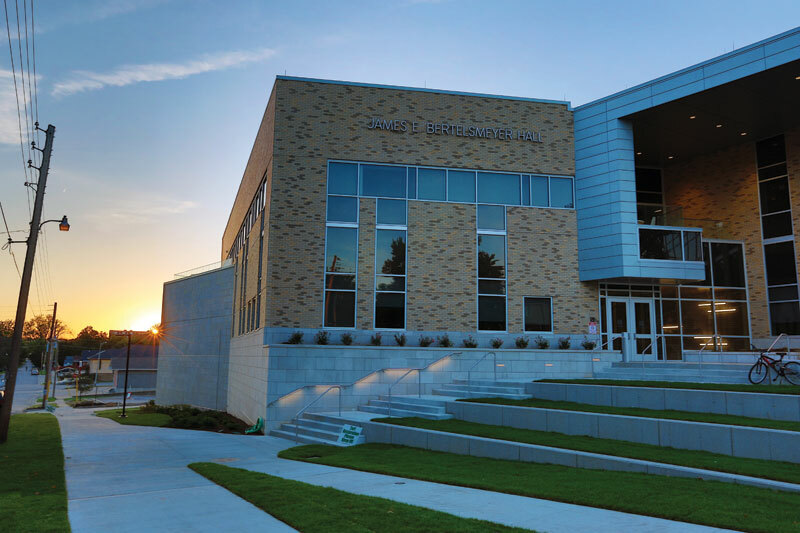 Bertelsmeyer Hall, dedicated Oct. 17, 2014. A 68,500-square-foot testament to the dedication of this academy stands at 11th and State streets: James E. Bertelsmeyer Hall. Academy members were instrumental to raising the roof on this $22.3 million facility with contributions totaling $7.5 million. 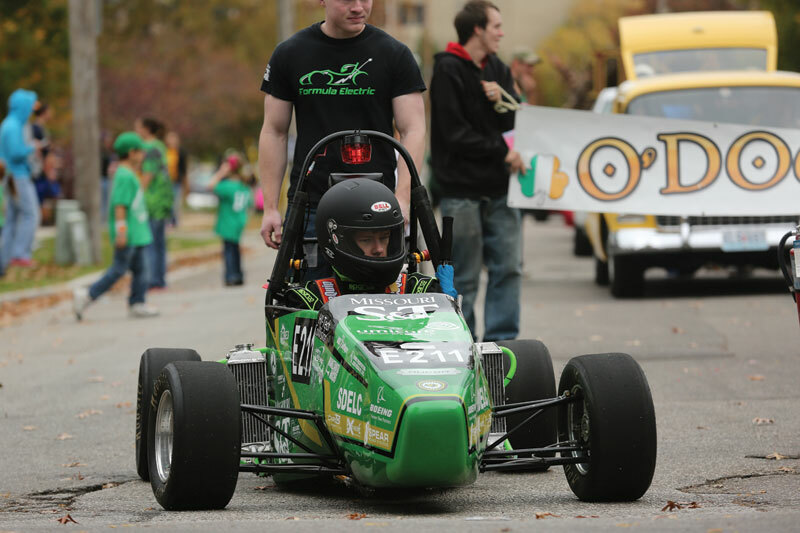 They also champion research and experiential learning through their support of graduate teaching assistantships and the Chem-E-Car team. You’ll find academy members mentoring students, hiring graduates and advising the department on everything from accreditation to technology transfer. 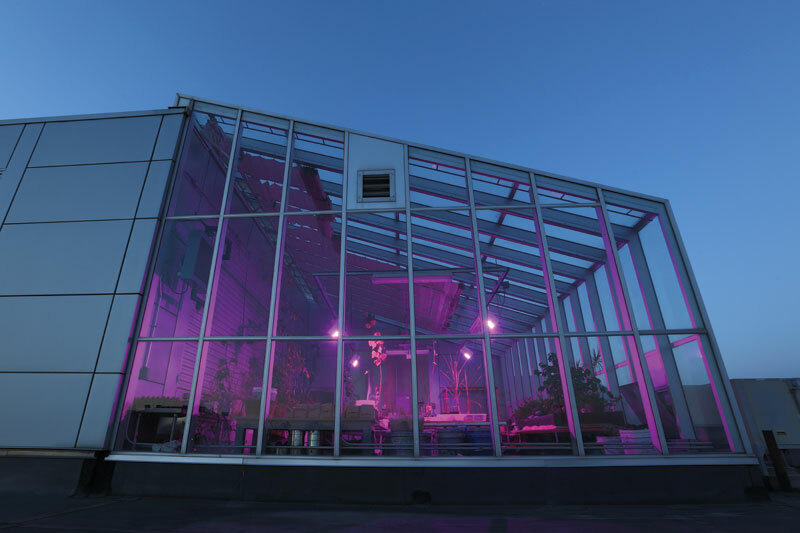 The purple glow emanating from the roof of Butler-Carlton Civil Engineering Hall comes from specially designed red and blue LED lights that promote and optimize plant growth in the Baker Greenhouse. Academy of Civil Engineers members helped fund the building’s renovation in 2003. Butler-Carlton Civil Engineering Hall in 2003. They were also visionary contributors to the 23,000-square-foot Student Design and Experiential Learning Center dedicated in 2011. Emotive bioinformatics company founder and CEO Tan Le gave the keynote address during the Golden Jubilee, which the Academy of Computer Science helped organize. Making history at the frontier of a technological revolution takes vision. Although the academy didn’t exist 50 years ago when the computer science department was founded, members stepped forward in October 2015 to make the department’s Golden Jubilee a landmark event. Academy members are also advisors and industry partners committed to advancing computing and other technologies through interdisciplinary research hubs such as Missouri S&T’s Smart Living signature area. Academy members have provided wisdom and leadership for more than three decades. In 2013, they embraced Missouri S&T’s “20/20 Challenge” by leveraging state matching funds with private contributions to endow needs-based scholarships. The academy established two new scholarships, adding to a legacy that already includes a number of endowed scholarships and a lab equipment fund. Members also advise the department on curriculum and experiential learning opportunities, now a university requirement for all undergraduates. Following a 2009 brainstorming session on how to make a bigger difference, this academy established a formal mentoring program. Today, approximately 20 academy members are partnered with students seeking professional perspective. Academy members also have established scholarship endowments, including a needs-based scholarship funded in response to S&T’s “20/20 Challenge.” They continue to serve as guest lecturers, assist the department with accreditation — and raise awareness of the business side of engineering. Strengthening experiential learning has been a priority for this academy since its inception. Toomey Hall’s exceptional labs are a testament to that. Academy members were instrumental to the construction of the Fluid Dynamics, Gas Turbine, and Dynamics and Control labs. This year, construction on a Kinematics, Kinetics and Power of Mechanical Systems lab began with funding from Nucor-Yamato Steel Co. The academy also supports scholarships, graduate teaching awards – and innovation. Every year, student design teams are invited to present proposals in a competition for funding. 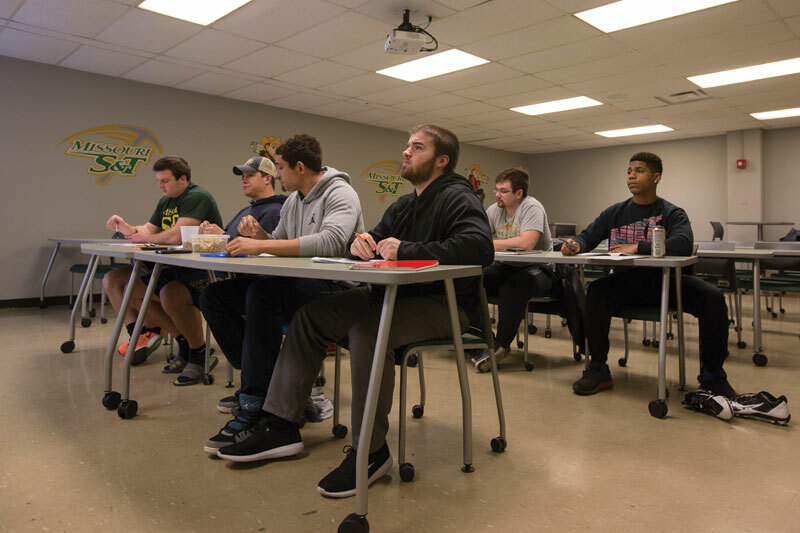 Miner athletes now have a comfortable, well-equipped classroom for team meetings, thanks to support from the Academy of Miner Athletics. Whether they are cheering for student-athletes in competition or the classroom, there is no more dedicated group of supporters. These former Miner athletes serve as advisors to the athletic director and mentors to student-athletes. Their generosity impacts every area of the department, from scholarships to equipment. Academy members also have helped to fund many enhancements in the Gale Bullman Building, including renovations to the room used for team meetings, film reviews and study halls. 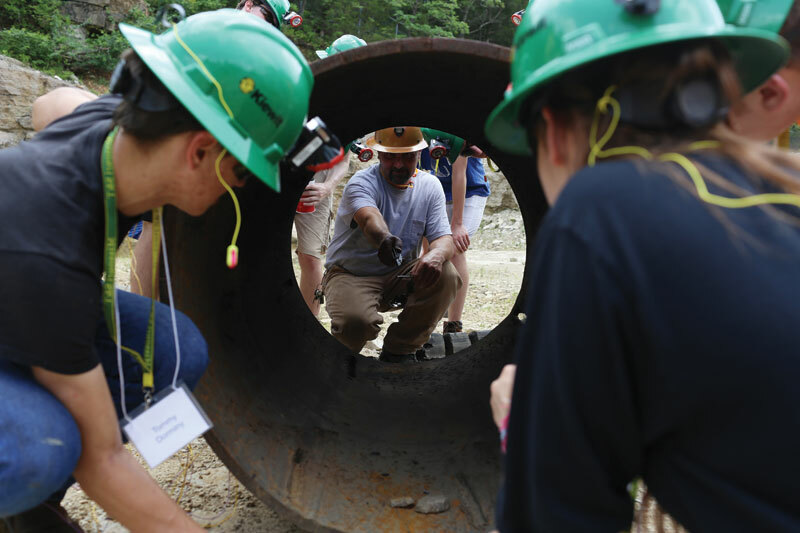 DeWayne Phelps (center), senior lab mechanic in mining and nuclear engineering, supervises students as they set up an explosive device at the Experimental Mine during the explosives summer camp. From explosives camps and geologic field studies to irradiation research, academy members are making a difference. They serve as advisors to three departments: materials science and engineering, mining and nuclear engineering, and geosciences and geological and petroleum engineering. They encourage future Miners by supporting summer programs for high school students. They award scholarships to students selected by their peers. They fund faculty awards recognizing early-career and senior scholars. And more than a few have ventured into the Haunted Mine to support this popular Halloween fundraiser benefitting student organizations.